Cartography is an integral part of human history since more than 8000 years. 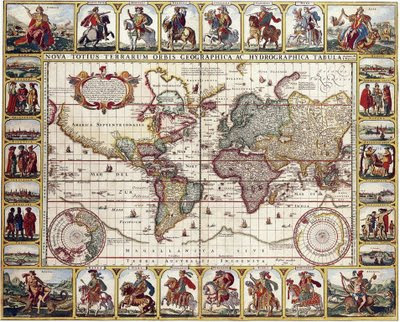 From cave paintings to ancient maps of the Old World, through the Age of Exploration, and on into the 21st century, people have made and used maps. This is a collection of historical world maps describing the known world in their time and at their state of knowledge. Description: World map Nova Totius Terrarum Orbis Geographica Ac Hydrographica Tabula Autore made by the Dutch cartographer Claes Janszoon Visscher in the 17th century, published in 1652. Download all world maps of this blog in the highest resolution available for a small donation via PayPal (minimum 15 USD). You will receive an e-mail with links for the download. Please check the highest resolution available, indicated bellow the maps. 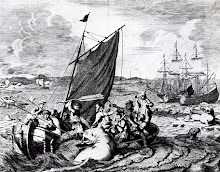 Note: All world maps shown in this blog and offered for download are in the public domain because its copyright has expired (copyright term of life of the authors plus 70/100 years) or they had been declared as public domain. T-O map (orbis terrae, orb or circle of the earth), is a type of mediaval world map and the earliest known representations of this sort is attributed to Beatur of Liébana, an 8th century Spanish monk. 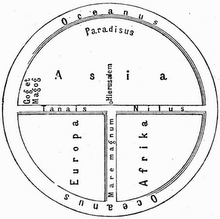 The T is the Mediterranean, dividing the three continents, Asia, Europe and Africa, and the O is the encircling Ocean. Jerusalem was generally assumed to lie at the center of the circle. The T-O map remained a common representation since at least the 7th century.